As Agni V, India�s most powerful strategic missile, lifted off in a blaze of brilliant orange plumes from Wheeler Island off the Odisha coast, the scene inside the launch control room resembled a twenty-twenty cricket final. India�s top missile scientists, who were sitting glued to their computer terminals that displayed Agni�s progress, jumped up and clapped every time the missile crossed a major milestone in the firmament. PERFECT LAUNCH: Agni V lifts off from Wheeler Island off the Odisha coast at 8.07 am on Thursday. At 8.27 am, it hit the planned target over the Indian Ocean, 5,000 km away. In the early morning of April 19, Agni V, India�s new big boy, stood tall on the launch pad on Wheeler Island off the Odisha coast. The sun peeped out dispelling the overnight clouds and exposing an azure sky. The missile was a glistening white interspaced with black, red and orange bands. It�s been a tradition of the missile team to say a little prayer and even do a �puja� before every major launch. So, soon after Agni V was readied for launch, a pundit was called to the pad itself to invoke God�s blessings. As he chanted the �mantras�, senior DRDO scientists, including VK Saraswat and Avinash Chander, squatted on the ground and folded their hands in prayer. 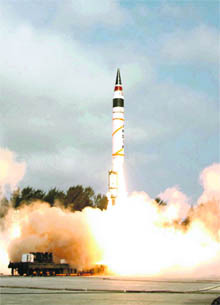 What has Agni V demonstrated about India�s missile prowess? India is now a missile power. It means we are completely self-reliant as far as this technology is concerned. In the eyes of the international community, India can design a missile system for any mission in this field. With this launch, whatever are the demands of our security forces in terms of various targets, geographical zones and other sensitive points, we can meet them all. Describing India's non-proliferation record as "solid", the US refused to express any concern on the country's nuclear-capable ICBM launch, which was successfully test fired on Wednesday. India should not overestimate its strength even if it has missiles that could reach most parts of China, the state-run Global Times of China said today, reacting sharply to the launch of Agni V missile by India.